Tesla: will the fairytale end this year? Although it is burning cash and can’t build Model 3s quickly enough, Elon Musk’s car firm continues to attract investors. So what gives? In the past 18 months, the world has seen some improbable events – most notably the election of Donald Trump and the Brexit vote – but what has been even more unlikely has been the financial rise and rise of Tesla. While the two elections involved ordinary voters, Tesla’s ranking last April as the most valuable car company on the planet was, remarkably, driven by hard-headed investors and analysts. In 2016, Tesla sold just over 76,000 cars globally, while General Motors sold 9.96 million. But that didn’t stop the financial markets valuing this automotive minnow at $51.54 billion (£38.03bn) last spring. That was more than one billion dollars above the market value of second-placed GM. Although analyst sentiment has shifted a little since then, the share price hasn’t significantly. Tesla’s biggest problem – one that we analysed in these pages back in November – is that it is struggling to get its new entry- level Model 3 into production. That is partly the reason it is losing huge amounts of money: in the third quarter of 2017, Tesla spent £457m, which equates to £38m per week. In theory, this all-electric luxury car looks a hit. So is it in practice? Such is the rate of Tesla’s cash burn that in late 2017 Bloomberg Intelligence’s market analysts estimated Tesla would run out of money completely by August 2018 if nothing changed. Indeed, in a note to investors at the beginning of this year, a Barclays analyst said he believed that Tesla would spend £3bn in 2018 as it struggles to get the Model 3 production lines rolling at full speed. He also predicted that Tesla would have to raise around £1.9bn in new funding by autumn 2018. For the first time, it looks possible that Tesla could stumble and even begin to wither. If it doesn’t meet its target of producing 20,000 Model 3s per month by July, the share price could finally slide and raising further billions to carry the company through the second half of 2018 might be much less easy. By the end of this year, the established premium car makers will arrive with their own Tesla-rivalling electric vehicles. 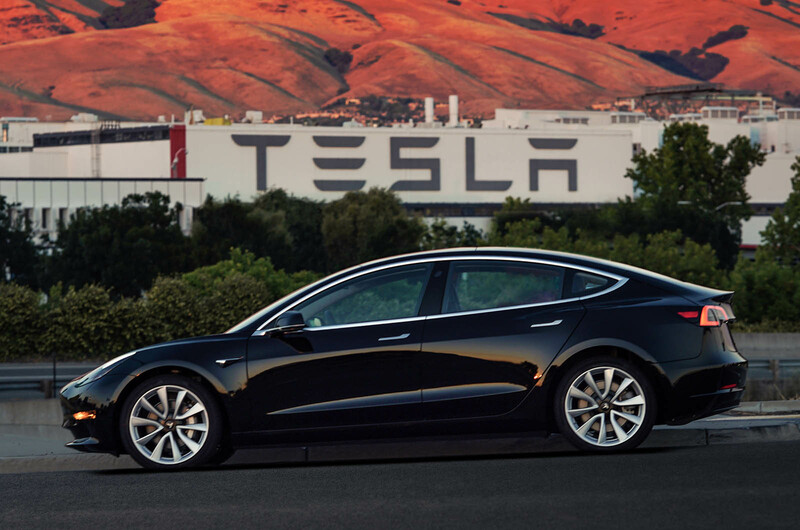 The progress of Tesla from the darling of investors and starry-eyed futurists to a serious car-making company hinges entirely on the progress of the Model 3. But even the company’s admission at the beginning of January that it had missed its production targets for a second time seemed to have little effect on its financial standing: the share price dropped by just 3.6% on the news but then sprang back. Progress of the Model 3 has been watched extremely closely over the past few months, as rumours began to emerge of serious problems with construction of the 3’s substantially steel monocoque. The Model S and X are constructed of aluminium, so shifting to steel for the majority of the Model 3 architecture (only the structures behind the rear seats and rear wheel wells are made of aluminium) put Tesla on a steep learning curve. 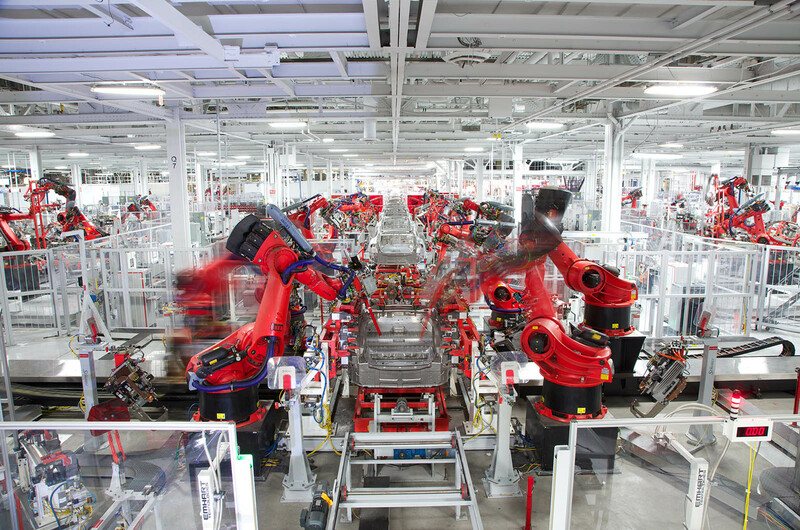 The other delay was at Tesla’s battery-making Gigafactory in Nevada. Sources told Autocar that errors in the construction of the battery can lead to much-reduced capacity. Officially, Tesla said it has to redesign two zones of the ‘four zone’ battery-making process, slowing the Model 3’s launch. Back in the here and now, the company shifted 101,000 Model S and Model Xs in 2017. That was up by a third over its 2016 sales and strong in a global luxury market in which the Mercedes S-Class sold around 84,000 units in 12 months. But, as analysts at Evercore ISI put it in a note to investors, the Model 3 “is the most important piece of the investment story”. Tesla wanted to build 5000 Model 3s per week by early 2018, but it has twice had to push that target back. It delivered 1550 vehicles in the last three months of 2017, well behind predictions. The company now says it will reach the 20,000 per month target by the start of July. Evercore ISI thinks Tesla won’t be hampered much longer by production problems. The analysts have pencilled in some 258,000 Model 3 sales across 2018 and is forecasting around 326,000 sales in 2019, which, along with a further pick-up in Model S and X sales, should get the company quite close the magic 500,000 annual sales that was its original target for 2018. At best it looks like that the total will in fact be around 370,000, one investment bank predicted. Clearly, the robustness of Tesla’s share price and ability to raise more money has not so far been undermined by slow production. Even the unveiling of the potentially distracting Tesla truck and Tesla Roadster (both scheduled to arrive in 2020, despite questions over where they will be built and how the R&D will be funded) failed to frighten the markets.But it remains a mystery to many in the financial industry why Tesla remains so favoured. First, it is not producing any technology that cannot be matched by the rest of the car industry. And when the premium car makers do arrive, with models such as the Jaguar i-Pace, Audi E-tron and Porsche Mission E due over the next 18 months, the feeling among investors is that Elon Musk’s company will not be significantly impacted. One analyst put these concerns to Tesla investors, and the main thrust of the response was that the Tesla brand was so overwhelmingly powerful it had nothing to fear from the arrival of competitors’ EVs. There’s no doubt Tesla can survive if it can reach the July production target and initial demand for the Model 3 holds up. As things stand, the company has a six-month window to get up to speed – and iron out the build quality issues that have plagued early 3s – before premium rivals appear. Probably the biggest threat to Tesla is the ability of established makers to build EVs with remarkable precision, reliability and offer a more experienced dealer back-up. New models from Porsche and Audi are also likely to outpace Tesla when it comes to autonomous driving features and cloud connectivity. But on the evidence so far, Tesla will remain immune to the usual rigour of investment norms. Who would bet against the company continuing to defy financial gravity? Seems to me it’s only a blip also, as for model three Tesla’s, I see two or three once a Week, it’s not pretty, in fact it’s looks a bit Alien to me, doesn’t look like it her Cars, maybe that’s part of its selling USP?, what makes me twitch is the selling price, an awful lot for a Car any Car for that matter. While some of the concerns such as the Model 3 production that Autocar has been raising about Tesla, are somewhat legitimate, why such a down beat over all tone for an innovation power house like Tesla? Also please do not talk about Audi Porsche electric products as if they are already better than Tesla's. Let's not lose sight of the fact that they do not even exist. Let's face the truth that the big Germans and the Japanese are playing catch-up with a brand that is in its infancy and that probably is one reason why Tesla has caught the imagination of the people the world over and investors alike. Indeed, a very down beat and generally negative article. Whether Tesla survive or not, what they have achieved in such a relatively short space of time is remarkable. Not just in the models they have created but more in the affect they've had on the car market, would we have even seen the I Pace? The power the brand has created is also astonishing and is proof that there is a new generation of car buyers evolving, one that cares nothing or even knows about 'grace and pace' heritage. They want connectivity for their connected lives and they want what they see as new tech. Autocar... why such a down beat over all tone for an innovation power house like Tesla? Tesla are building the future today. And they're having to roll out a charging network too! Did the original car manufacturers also have to build petrol stations? The only company yet to challenge Tesla is Jaguar with the i-Pace. Yet nothing said in this article. Jaguar already know how to build cars, something Tesla are having to learn. Both of them had to learn how electric propulsion would work, and now Jaguar knows too. If anything we should be celebrating both companies.
. Your last sentence hit the Nail on the proverbial “caught the imagination “ because they were first in, because their Cars were so blinding much quicker than the Ferrari, Porsche brigade People took notice, the novelty of something completely differently powered, the arrival of Electric power as an alternative to Fossil powered Cars,now, a few years on others are doing it with some success, the problem for Tesla is that they’ve not just been caught up with they are getting swallowed up by better more efficient Cars from mostly the established Brands, small volume makers like Rimac are currently the Car to beat, there is room for them,but really what’s needed are cheaper Electric Cars for the Family for the Daily commuters, why aren’t there any more being developed?, Tesla will survive, but, the shock and awe Days are over, even Dyson isn’t thee name in Hoovers anymore. Teslas are 25 - 100% "fossil powered". Sure, even if 100% "fossil powered", their emissions are a lot lower than ICE cars, but they are still "fossil powered", saying that they are not is absolute nonsense. I work in the electric car industry and I m fed up with hearing rubbish about them. I am not knocking Tesla or electric cars, but the fact that they are a good thing and the future of automotive powertrains does not excuse people and companies perpetuating unscientific psuedofacts like theyre "non fossil powered" or that other ridiculous claim - that theyre "zero emissions". This article is not "negative", its simply talking about the risks Tesla is potentially facing. Nope, in Norway 100% of the energy for Tesla's (big market) comes from Hydro and other non-fossil methods. France 60+% of their power is Nuclear, only 2% is either oil or coal. My point was that - with the exception of Norway as you pointed out - all Teslas are "fossil powered" to some degree. The poster I was replying to obviously does dispute this as they suggested that Teslas were not "fossil powered", youd have seen this if youd read the thread. Gas is also a fossil fuel and France still uses it to generate electricity. I cant see the relevance of diesel to this conversation, but your statement about it is incorrect - diesel in the Europe is about 95% fossil fuel, the rest comes from bio sources. And obvisouly if someone wants to, they can run their diesel on 100% bio diesel, or indeed, on 100% SVO on some vehicles. I work in the electric car industry and I m fed up with hearing rubbish about them. Do you make motorised scooters?